So we’re at the first day of the year again already. 2017 was a challenging year, but not without its rewards. I spent far more time in ICU wards than I would have liked and, although one of the OAPs pulled through and is restored to good health, we lost another earlier this month. Through that turmoil, some big work changes and the start of a fledgling relationship, I’ve been surprised by the reactions of some. You think when you hit this age that friendships are set but this year proved otherwise. I’ve been humbled by the support and love given by many, and saddened by those who stepped back or away completely for whatever reason. Others have reconnected and new friendships have also been forged. On balance my circle is healthier for it. All the best for 2018. Grasp it, enjoy it, live it. It’ll be awesome, it’ll hurt, you’ll laugh and you’ll cry. Submerse yourself in it and do the best you can. Life is short; don’t waste it, make it count. As my favourite group of Swedes would say (and did say, way back in 1979) Happy New Year. I may be a sad singleton living alone with a furry stalker (my rescue bengal cat) but I am lucky enough to have a group of very lovely friends. Some of them are really creative on top of being great mates and seem to cram a huge amount into one day. One such friend, Claire, has sent me a couple of parcels lately – which I’ve been very grateful to receive. As well as having two small children at home, she manages to find the time to bake and sew, as well as keep a blog about it. 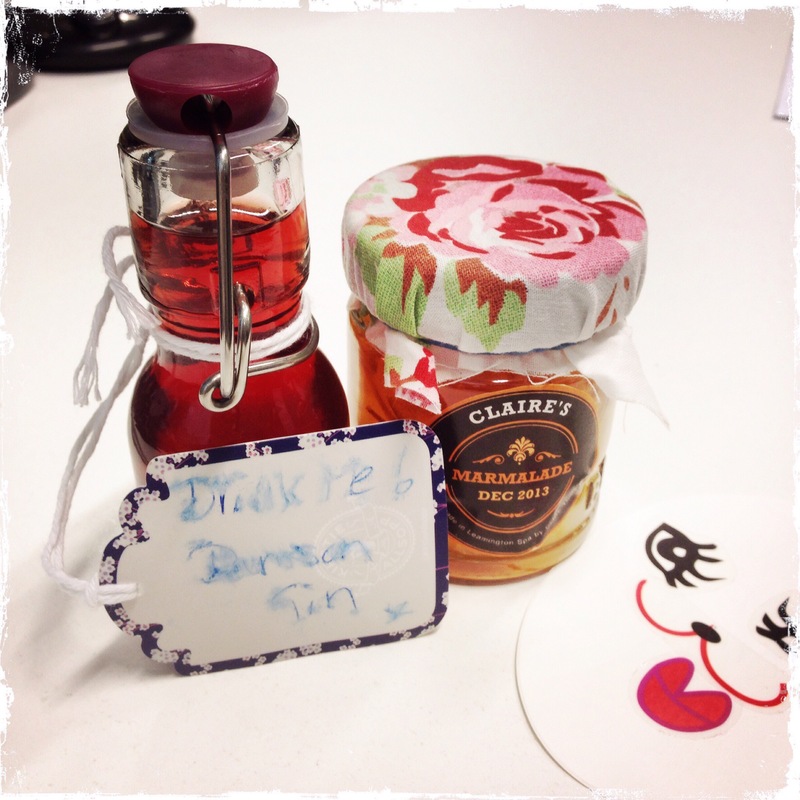 The first parcel I received was a jar of this year’s batch of marmalade (despite what the label says) which is delicious, and a small bottle of damson gin. I haven’t tried this yet. I’m not usually a gin fan, but this smells gorgeous so I will try it very soon. My second parcel arrived this week. I had been to visit Claire recently and she’s got back into sewing whilst being on maternity leave. We’d spent some time pottering around town and went into a local shop where lots of different people could sell and showcase their crafts. We both bought some bits, and Claire picked up some ideas of things to make, including dribble bibs and mini baby change pouches. I remembered I had a lot of fabric at home that I’d got for some previous craft projects that I’d not continued with so the next time we met up I passed it over. Claire promised to make me a few things out of it and she was true to her word! She said they were only samples and needed some work, but they are really well made and look perfect to me. 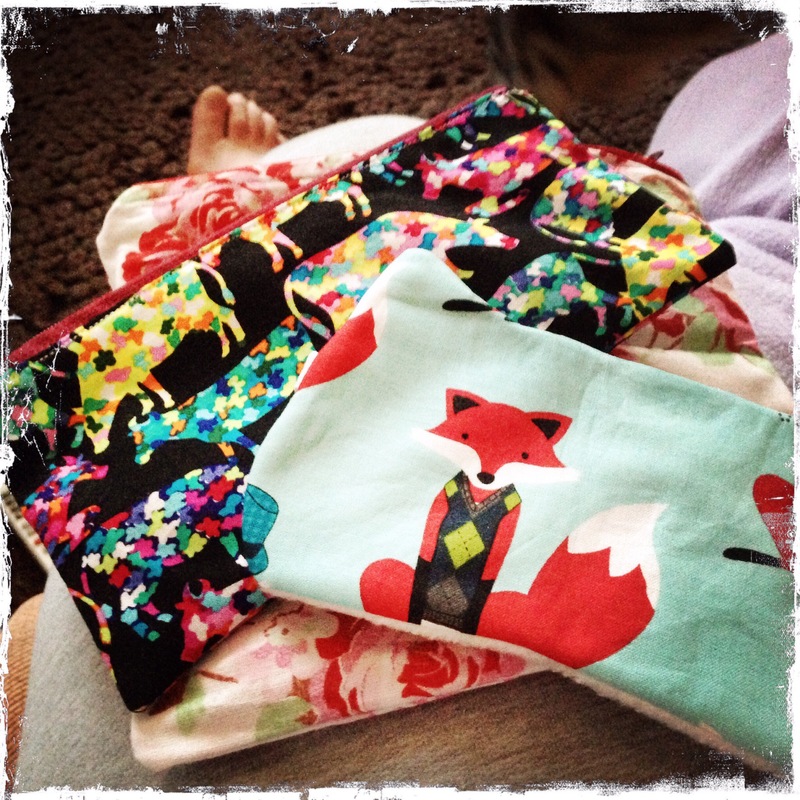 I received a cat-head shaped sleep mask (made out of a fabulous foxy fabric, that she’s also made her two year old daughter a skirt from) and two zipped and lined pouches. These are both from fabrics I had donated – one a great starry cow print and the other a Cath Kidston-esque shabby chic rose pattern. They are all fantastic and I have no idea how she finds the time but I’m very glad she does. I have given her a few more ideas of things to try to make (all fired by self-interest!). I think she should definitely make them to sell or at the very least as gifts for friends and family – the kids bits are really great and practical – the latest creation is a crayon holder and is a brilliant idea (and would be good to store make-up or grown-up art supplies or just pens and pencils). My eye mask and pouches are really useful – and I’ve offered to be the guinea pig should she decide to make a sample Kindle cover. How nice of me!